Paired with the leafy green romaine lettuce, spicy ginger, seasonal clementines, and a splash of fresh lemon juice, this juice is not only bursting with flavor, but also with a hefty dose of vitamin C and folate. SONY DSCAs always , feel free to adjust any ingredients to suit your personal tastes. If you'd like a sweeter juice, try adding a few more carrots, or a couple drops of liquid stevia, tasting as you go. Enjoy and stay well! 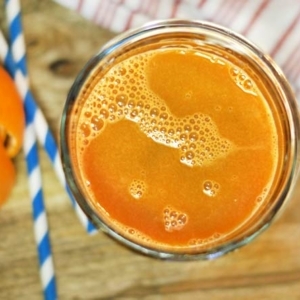 Run all of the ingredients through a juicer, and drink immediately! For best results, use a masticating juicer, which handles leafy greens and delicate items, such as ginger and clementines, effortlessly.